Someone once told us that the type of shoes a man wears tells you a lot about him. If that’s true, it’s best to pick wisely! We’ve rounded up a few brands worth a look-see, and also what they say to us. Brogues, Oxfords, loafers, sneakers—Dmodot has it all. These shoes especially work for a guy who’s neither to stuffy nor too casual—somewhere right in the middle. Don’t want to play it safe? Give those green tassel leather loafers a go. A man who wears these: Is well put together, but still wants to let his fun side show. Think of someone with old-school charm, as well as a city boy attitude. 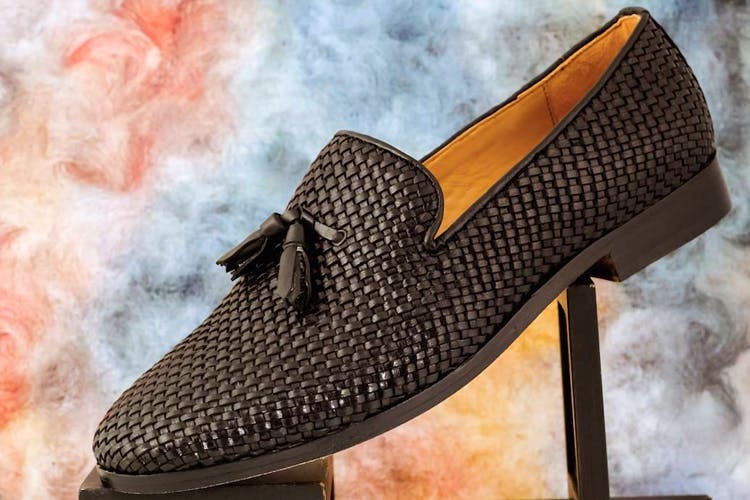 From embroidered suede loafers, dapper multi and single tone leather brogues, brogue-styled sneakers, and patent leather dress brogues, Hats Off Accessories is all about handcrafted leather footwear. A man who wears these: Is dapper, but also likes to still keep it casual. A footwear start-up based in Berlin, Koch & Co. offers a curated collection of handcrafted, Goodyear-welted shoes for men. They have four classic silhouettes, Oxford brogues, monk straps, loafers, and captoes, all of which come with a complimentary leather shoe balm, two silk monogrammed shoe bags, and their signature pull drawer box. Plus, these are known to last for a long time. A man who wears these: Always chooses the best for himself. Whether its shoes or friends, he has his few favourites and keeps them close for life. This high-street footwear brand sources materials from the best tanneries around the world. If you’re not choosing from their existing designs, you can get them to customise a pair according to the design, fabric, and style you have in mind. They give you the option of embossing your initials on the shoe as well! A man who wears these: Knows what he wants and isn’t afraid to ask for it. Classic design never goes out of style, a fact that Achilles’ Heel knows well. With their collection of Oxfords, smoking slippers and comfortable but sophisticated sandals, they’ll dress up any ensemble. A man who wears these: Is your chivalrous dreamboat. Polished and polite, he looks dapper in a suit, and even better when he’s holding doors open for the ladies in his life. Sigh. Oxfords, Derbys, Monks and loafers, you can trust that you’ll be spoilt for choice at The Shoe Factory. Their choice of materials, colours and finishing is on-point, and whether you’re in for muted elegance or a kooky edge, you’ll find it. We’re big fans of the colourful loafers. They’ll also do custom work if nothing they already have appeals to you. Win! A man who wears these: Is multi-faceted. He’ll go from a black-tie event to a fun evening of bowling. And who doesn’t love a versatile man? Easy breezy kohlapuris in a myriad of colour combinations, Chappers are great for when you want to turn your style game up a notch whilst keeping it casual. Their two-toned offerings are both comfortable and regal at the same time. A man who wears these: Is as cool as a cucumber. You can bet he’ll turn some heads, especially in a sherwani. Cuero does hand-crafted leather shoes, creating everything from moccasins and penny loafers to brogues. Think muted mahogany tones and rich, delicious deep browns and you’ll get an idea of the colour palette. These can be paired with any kind of clothing, we think. A man who wears these: Is probably your quintessential gentleman. He may not experiment too much, but what he does, he does well. Top points for consistency.